Profitability Right Out Of The Box, Uh, Tower. 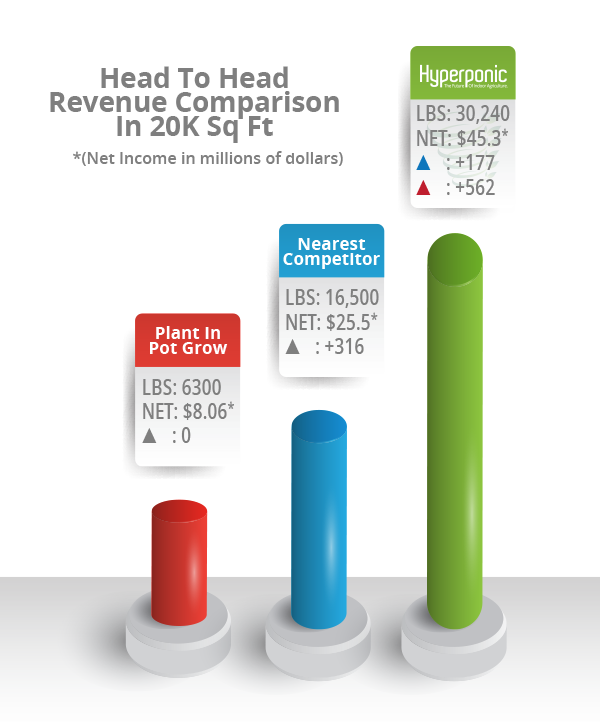 Hyperponic™ offers qualified licensed growers the opportunity to have a complete custom designed and installed CropTower™ system with little upfront cost. Our initial Equipment License Program fee is easily recovered in a single grow cycle. Our equipment leasing program consists of turnkey, professionally installed system designed to fit your exact floor space. We will train your personnel to operate and maintain the equipment. Hyperponic™ will monitor and provide 24/7 assistance to ensure no crop-damaging down time. It is the grower's responsibility to provide an environmentally controlled space for the installation. That means that we would be converting an existing cultivation room into our CropTower© System. All CropTower© units will be installed in this grower controlled environmentally-balanced space (A/C, RO, rH, CO2). All CropTower© mechanical and computer equipment will be installed in a separate area. The grower must provide access into these areas, ie. double doors. The Grower will provide and cultivate the required number of clones and subscribe to Hyperponic's™ method of propagation. The clones will be placed into the CropTower™ for the last 2 weeks of the vegetative cycle and the complete flowering cycle...typically 6 to 7 additional weeks. Our monthly fees are determined by varying state laws. In many states, the fee is based on the expansion current harvest levels, the volume grown by the CropTowers™ or an equipment leasing program. By providing a breakthrough infrastructure for the agriculture industry and by partnering with growers, Hyperponic™ becomes an integral part of the grow operation from end to end providing consulting, equipment, computer systems, fertilization systems and grow operations oversight. Maximizes the use of floor space by growing vertically as well as horizontally. Uses engineering to provide a closed, fully-integrated, controlled environment. Integrates technology and computer systems to monitor the environment, feed the plants the precise nutrition at precisely the right time and provide real-time data in a cloud-based system for monitoring each grow remotely from anywhere. Uses high efficiency LED lighting in a 360 degree envelope around each tower to maximize grow efficiency and reduce the use of electricity and drain on the A/C. Grows in no soil or coconut husks, so roots are also available for harvesting. As wholesale and retail commoditization begins and margins fall, growers will have to become more efficient in their operations. CropTowers© provide that solution. Hyperponic’s CropTower© System, is a network of 8 to 20, 10’ tall, vertically-integrated, fully automated grow towers that maximizes warehouse space and reduces production costs for growers. With CropTowers™, growers can expand their yield up to 3X over their current production in the same space, drastically reducing expansion and production costs. Growing crops with our proven CropTower™ aeroponic system provides commercial growers a consistently controlled environment to produce high yield crops while maximizing valuable floor space in any indoor growing environment. Our computer-regulated system optimizes proprietary nutrients, water and temperature to maximize production and provides real-time data in a cloud-based system for monitoring each grow remotely from anywhere. Plants receive the precise nutrition at precisely the right time.